Organizing the hugely anticipated holidays represents for some families a pleasant pastime, for others a major challenge. Go Tourism takes on the not-too-small job of getting the whole family to agree and enthuse over an upcoming trip by proposing fun, entertaining, educational itineraries, appropriate to the age, desired pace and the interests of each family member. When it comes to that ONE very special trip far from the madding crowd, whether it’s a honeymoon, a renewal of vows or the simple desire to spend time alone with your loved one, we pride ourselves in thinking outside of the box to create a unique celebration for you. 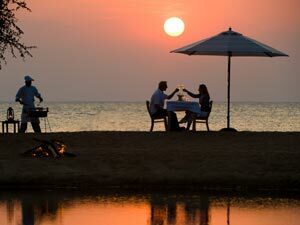 The honeymoon myth was born under the stars in a wood cabin perched high in a Baobab tree… on a Route 62 road trip through the desert… on a Dhow sailing into the sunset… during a romantic picnic on Livingstone Island in the middle of the Zambezi River…. Romance, charm, intimacy, surprise…we know where to find just what you’re dreaming of. 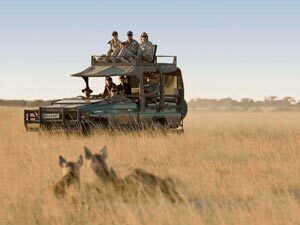 The traditional image of khaki clad tourists racing through the bush in overcrowded minibuses does not sit well with us. 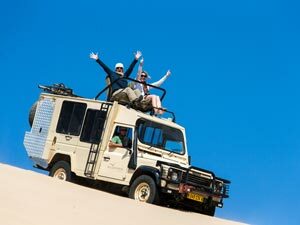 The safaris we propose are specifically adapted to our clients with the aim of getting them up close to an unspoilt nature (by foot, 4×4, horseback or canoe), or by more unusual means (hot air balloon, elephant back or quad bike), for a truly authentic experience. You can also choose to actively participate in the everyday life of a game reserve by assisting the game rangers and vets in treating and studying the animals, fly in a helicopter to count the herds or drive a 4×4 through rugged terrain. 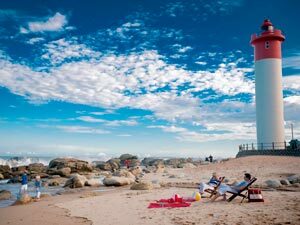 From the most famous game reserves to the lessor known parks, we’ll give you expert advice on where/when/how to benefit most from the gifts that Mother Nature has to offer you. Just as Hemingway, (who was enamored with the east coast of Africa) did, so too will you fall under the spell of this beautiful coastline and its exotic, tropical islands. Lined with broad white beaches, the Indian Ocean is best known for the immense wealth of its seabed. Reel in a swordfish, spear reef fish, dive into the multicolored coral gardens, or simply laze on the pristine sand…. When travelling, observing is one thing, but getting involved and learning about a local culture by “living” it, is quite another. If you’d like to experience a destination as an “insider” then this formula is for you. 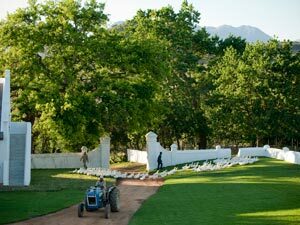 Imagine….your own “Out of Africa” homestead in the bush or a farmhouse on a working farm? A fisherman’s cottage by the sea or a city loft apartment? We have just the right address for you to live out your fantasy life for a while. If travelling for you means taking the pulse of a city by blending into the anonymity of a crowd, shopping at neighborhood markets, attending a sports event, seeing the latest show everyone’s talking about or having a drink at the corner bar with the locals… Well, then you’ve knocked at the right door because we have an endless source of ideas and hundreds of addresses to share with you! 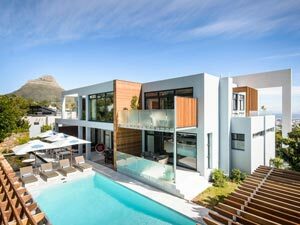 Cape Town is World Design Capital 2014: numerous urban projects are embellishing the cityscape, sculptures and installations are growing up in green spaces, and former industrial areas, such as Woodstock and The Fringe, continue their rehabilitation. These trendy neighborhoods, newly elected by artists and “hipsters” alike, are a delight for the curious shopper, gallery goer or gourmet aficionado. We’ve built up a portfolio of “off the beaten track” culinary experiences where food adventures abound. Each culinary encounter is carefully designed to immerse you in the local culture and to reveal the true spirit of a region. We offer courses run by passionate chefs, meetings with farmers, tastings, visits to food markets and gourmet dinners hosted by locals. Do you crave the feeling of freedom that wide open spaces procure in you and the sensation of being dwarfed by the immensity of landscapes stretching into infinity? Then don your walking shoes and grab your rucksack because nothing quite matches exploring a new land by foot to discover its soul. “Slow-tracking” gives perspective on distance whilst enabling one to simultaneously marvel at the countryside and exchange with the people we meet along our way. 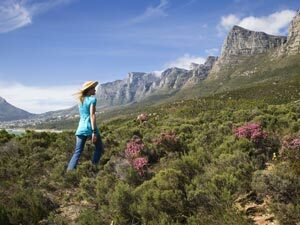 We have a selection of breathtaking “green itineraries” for you of various durations and physical levels. 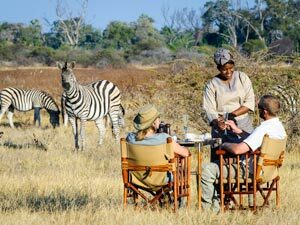 An “Out of Africa” tented camp, a Robinson Crusoe cabin in a little corner of paradise, a tree house overlooking the savannah, a houseboat on Lake Kariba, an “African Queen” cruise down the Zambezi River, a vintage Airstream caravan overlooking the vineyards: forget the old humdrum of life for a moment and live your fantasy! We can find you the accommodation or ambience best suited to turn your childhood dream into a colorful reality, oozing with charm and playfulness. Whether you’re of a contemplative nature or an extreme adventure junkie we orchestrate unforgettable, life altering experiences. 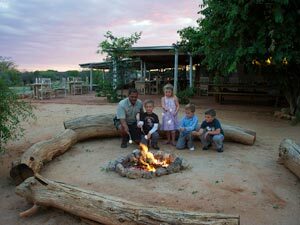 Imagine … walking with elephants, cheetahs or lions, diving with sharks, canoeing surrounded by hippos and crocodiles, taking a hot air balloon ride over deep canyons or spending time with bushmen to learn survival tactics in the desert. These few examples are just the tip of the iceberg of what we have to share them with you! Dreaming to disconnect from your daily life and to gain a different perspective? We’ll give you the opportunity to immerge yourself in a completely different culture, a world far removed from yours, to live an intense human experience. 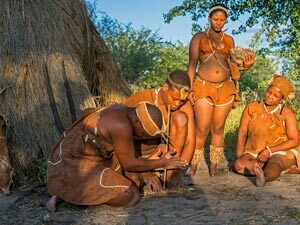 Southern Africa is a true melting pot where the artistic, musical and visual wealth is well and truly embedded within the numerous ethnic groups. 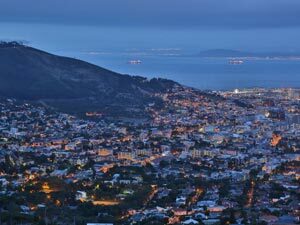 Spend a night in a township and learn how to play the Djembé and dance Kwaito, sip chibuku (local beer) in a clandestine tin roof bar; have a “braai” (BBQ in Afrikaans) – the central element of social life in southern Africa – listen to talented jazz musicians, learn to prepare a Malay curry with a family in the Bo Kaap district, discover shops of traditional witchcraft (sangomas) and buy monkey skulls and crocodile bones to cure or divine the future; wander the galleries of ultra-contemporary African art… We have the know-how and the contacts! 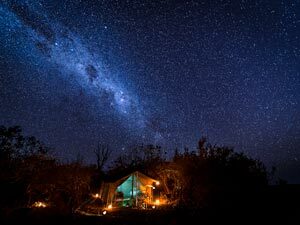 A hot tub under the African sky… a deep tissue massage in the middle of the bush with local plant extracts… Space, serenity, simplicity… There’s nothing quite like it to restore inner peace and to boost one’s energy! 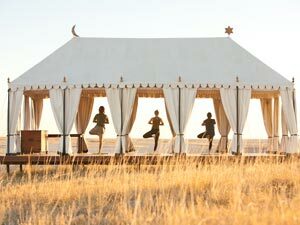 We have compiled a list of the best places in southern Africa to pamper yourself, meditate and practice yoga. Kings, presidents and movie stars have traveled in these mythical machines. 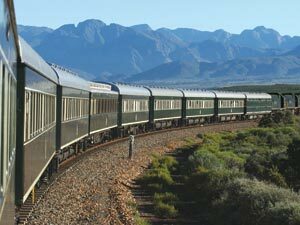 Their names, “Rovos Rail” and “Blue Train” have become synonymous with luxury and elegance. Travelling back in time on a steam train for a day or several weeks is a great way to relax whilst enjoying the splendor of the African landscape as it unfolds before your eyes. Be warned…, giraffes, zebras and crocodiles inhabit the fairway! 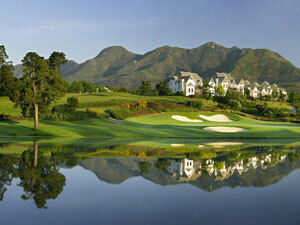 Golf enthusiasts can choose from a myriad of spectacular golf courses in South Africa where your passion for the game and love of nature make for a perfect combination. The tone is given with the famous “Extreme 19th” hole which is accessible only by helicopter and played to a green in the shape of the African continent, some 360 meters away and at 430 meters altitude. With a prize of 1 million US dollars for the first “hole in one”, a slight vertiginous sensation may overcome you!